Diane Ackerman is one of my favorite authors — if you’ve never read her book A Natural History of the Senses, then I suggest you skedaddle to the nearest library and check it out. It is exquisite, particularly when she writes about our sense of smell and our sense of touch, how/why certain customs and words evolved and so on. The Zookeeper’s Wife is another good one. The latest I’m reading is Deep Play, and so much of it resonates with me on so many levels. My sense of place, my self-definition and the themes I encounter in my daily life — it’s like all of us on this planet really are pulsating to the same rhythm, at different times and sometimes the same time. One breath, one voice, one consciousness. Blows me away. I believe it’s a vibration we’re unconsciously aware of on a subliminal level when we engage in deep play,alone and in community. And the deeper we go in our play, the more in tune with others we seem to become. More intuitive and sensitive to the subtle nuances and layers of meaning in our everyday language, geography, and encounters, more in touch with our essential spirits — that spirit that transcends time, space and our bodies. It can be scary and exhilarating simultaneously. A state of heightened attention because we are so in the zone. Riding that Big Kahuna. This entry was posted on January 7, 2010, in library, Self-discovery, wonder, You can call me a book worm and tagged Books, Words. I’ve not had anything in my etsy shop for quite some time but thought I’d give it a go again with my latest idea. I love Persephone books but I’m not about to start a publishing company reprinting some of my favorite OOP (out-of-print in library lingo) books, or just plain favorites from my reading history. But I do love books and I do love tea, both of which I also like to share. So my etsy shop is now a place where I will sell vintage and thrifted, otherwise homeless books along with some of my favorite teas. The catch is of course, trust. The customer trusting that the book I send they will enjoy because I am covering the books with maps and brochures from my travels. 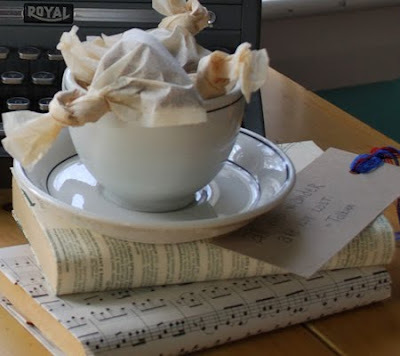 So there will be no conscious choice in this other than that someone decides they need a book and some tea (or perhaps a friend needs it), and I am the book lover to send it, so it is sent. I will also have no idea what book I am sending out to someone. Why? Sometimes surprises are good. And sometimes what appears to be a surprise at the time may prove to be synchronicity. Like maybe there is a particular book someone is needing to read or reread and through no conscious work on my part or theirs, that is the book that appears in their mailbox. The only choices will be around the tea — and that I’m working on. For now I just have vanilla rooibos. And sometimes I’ll probably include a couple vegan cookies for good measure (I’m having a ball creating recipes for them and sharing the cookies). Just because. It’s kinda fun, you know? I had a post in mind earlier this evening on our way back from Roche Brothers but by now I have totally forgotten it. Wish I’d noted it someplace but oh well. My — all of a sudden I realized what it was! My eggnog latte made me think of it! Had stopped at Starbucks earlier to see if they were hiring because I have been bitten by the barista bug. 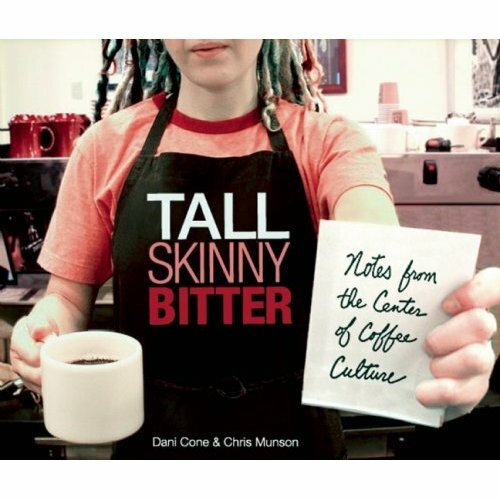 I found the book Tall Skinny Bitter in a coffee shop a couple of weeks ago and love it! It was written by a Northwestern barista, and while they don’t like Starbucks, pickin’s are slim here on Cape Cod, and I just want to learn the trade. It could be fun, it could be hellacious, but I won’t know until I try and it certainly looks fun — and all the people in the book say it is fun, so why not? AJ, the Starbucks barista I’ve known for a few years now, was there tonight, gave me an app, and she said it is a lot of fun, so I’ll see. Granted, most baristas are half my age, but they’ll catch up. While Amazon’s image was better, Sasquatch Books is the publisher. I’m on my way over to request their catalog.